Periodontal disease is one of the most common causes of tooth loss in adults. Symptoms can include gums that are inflamed, swollen, recede or bleed easily when teeth are brushed or flossed. Dr. Afar, West Hollywood periodontist, recommends that anyone with symptoms of gum disease visit for a thorough exam, diagnosis and treatment plan in order to control the infection and restore gum health. Gum disease that is not properly treated can lead to gum, tooth and bone loss in the jaw. Once this loss occurs, it is not reversible. Periodontal disease is associated with such major health conditions as diabetes, pregnancy complications and cardiovascular disease. According to researchers at the Karolinska Institutet in Sweden, severe gum disease may also be associated with breast cancer. Study participants, including more than 3,000 women between the ages of 30 and 40, received comprehensive dental health exams. Women who suffered from periodontal disease or who were missing molars were more likely to develop breast cancer. Taking care of your gums requires the same attention to dental hygiene that taking care of your teeth requires. 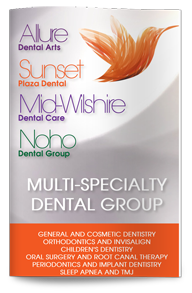 Brush your teeth twice daily, floss them daily and visit Dr. Afar, West Hollywood dentist, at least two times a year for professional cleanings and dental exams. If you are a smoker, are pregnant or have health conditions that may make you more susceptible to developing gum disease, talk to our dentist about ways you can reduce that risk and keep your whole smile healthier.